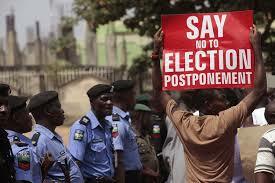 Nigerians were supposed to go to the polls on Saturday for their Presidential election. However, the election was postponed by Jonathan’s ruling People’s Democratic Party (PDP) to purportedly focus its attention on defeating Boko Haram. The election is now scheduled for March 28, but an extra six weeks hardly seems to be enough to time to help end religious terrorism in the North. Those critical of the postponement are right to point out that the PDP is just securing more time to rally campaign resources. The party was unprepared for the rise in popularity of the opposing candidate, former 1980’s ruler General Muhammadu Buhari, and his party, the All Progressives Congress (APC). Former President Obasanjo was incensed enough by the decision that he tore up his PDP membership card in public today. This was a major blow to the party since he has been one of their ardent supporters since the party took power 15 years ago. The PDP itself is now suffering from its misstep, as party leaders are obviously divided. The largest tragedy of the postponement is that it is a symbolic win for Boko Haram. As an Islamic fundamentalist group, it is opposed to elections and the democratic system as a whole. Following through with the elections would have been the move necessary to show the group that democracies do no kowtow to terrorist threats. It is further troubling because through Nigerian’s postcolonial history of over a dozen military coups, postponement of elections has been part and parcel of leaders’ attempts to maintain power in the face of a potential defeat at the polls. Many of us had hoped that period had ended with the transition to “democracy” in 1999, but Jonathan’s move is a worrisome step back in that direction. A Chinese-built BigFoot MRAP of the Nigerian Army on patrol in the Far Northeast.